Tamarack is a larch that is found in boreal forests around the circumpolar north. 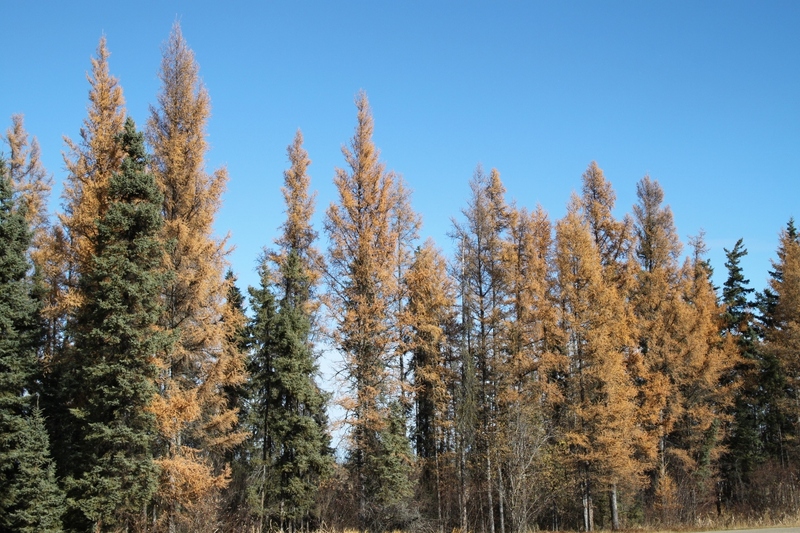 In late October, the tamarack in this mixed stand were still covered with their golden needles, standing in contrast with the dark green of the black spruce. Tamarack is a conifer, having cones, but unlike most conifers in Alberta, it is deciduous and loses its leaves (needles) each fall. This stand is along Highway 16 West, near the Cougar Creek Golf Course. Cite as: Campbell, Sandy. "Mixed stand of tamarack and black spruce ". Photograph. 2017. University of Alberta. ERA: Education and Research Archive.